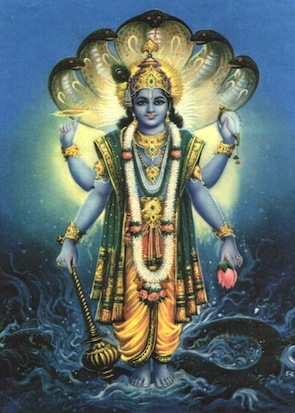 Vishnu is the second of the Trimurti( Brahma, Vishnu,Shiva) and he sustains and protects the Universe. His role is a lot more complex than Brahma’s. While Brahma creates the Universe, Vishnu is the source of all Creation. Vishnu is the All-Pervading One. His name is derived from “vis’ in Sanskrit which means both ‘to spread’ and ‘to be present everywhere’. Even when there was Nothing, there was Vishnu, present as a nameless, formless, dormant energy. In this un-manifested (nirguna) state, even Vishnu was not aware of his own being. He just was. Just because he was not perceived, does not mean he did not exist. In this Nothingness, when the first ripple of awareness stirred , spontaneously and of its own will, the formless energy became Vishnu, the Supreme Being, Parabrahman. As Parabrahma, Vishnu lies in a dream like state on the serpent Adisesha Ananta who is Time, without beginning or end. Ananta floats for all eternity on the waters of the Ksheer Sagar ( the ocean of Cosmic Consciousness). When Brahma begins the process of Creation, it is Vishnu who expands into everything and becomes part of everything. Now he is Brahman, the Cosmic Consciousness. As if he is seeing a dream, Vishnu watches Brahma create the Universe. By the act of watching his dream, Vishnu sustains the Universe. When Vishnu wakes from his dream one cycle of Creation ends. Vishnu who dreams up the Universe must also now protect it. To maintain the order of Creation, Vishnu becomes The Protector. He takes the form of Ishwara or God. 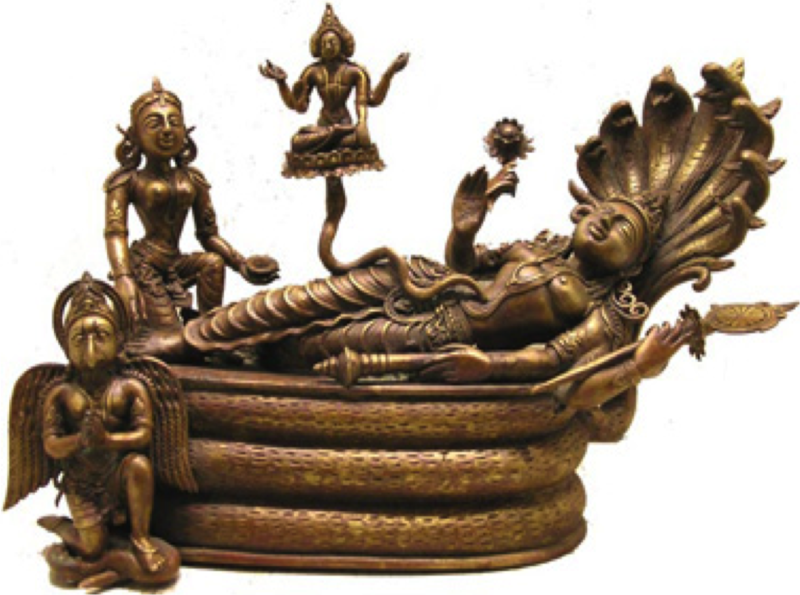 This form of Vishnu looks very different from the one reclining on Ananta. He is standing,radiant as the sun and has four arms. In his hands he holds the Conch, The Discus, The Lotus and The Mace. From the Nirguna Brahman( formless energy) Vishnu thus becomes Saguna Brahman, a God with forms and attributes. Vishnu is now the Supreme Lord, Parameshwar. At times, when world descends into total chaos, Lord Vishnu comes to its rescue in the form of an Avatar, or incarnation. References to Vishnu are found even in the Rig Veda, the oldest of the scared texts. Almost all Hindus worship Vishnu, either in his original form or as one of his Avatars. Chanting the Sahasranama, the thousand names of Vishnu, describing his thousand attributes, is an ancient way of worshiping him, and is still used today. A way that has no doubt re-enforced the greatness of the Supreme Lord on the Hindu psyche since the early ages. Brahma, Vishnu and Mahesh( Shiva) are the three main Hindu gods. A Hindu Trinity of sorts. Brahma creates the Universe, Vishnu sustains it and Shiva destroys it, so that it maybe created again. To get to know these gods better, we have to understand the key roles they play. So let’s begin with Brahma. Like all religions and cultures, Hindu texts are also full of Creation myths. Some more well known than others. The Puranas ( Collection of God Stories) tells us that in the Beginning there was Nothing. All existence was hidden in the un-manifested waters of the Great Deluge, the Mahapralaya. Vishnu lay in deep sleep on the Serpent Ananta( one without beginning or end), who was floating on these waters. In his dream, Vishnu dreamed of this Creation and a lotus sprouted from his navel. Sitting in the lotus was Brahma. Brahma opened his eyes and was very surprised to find himself there, alone, in the middle of Nothing. He tried to find where the lotus was stemming from but it appeared to have no starting point. Just then he heard a voice asking him to create a universe. Brahma was confused. He thought about many different forms and shapes he could create and then finally settled on the symmetric form. He created the four Kumar Rishis, Sanaka, Sanatan, Sanata and Sanat, from his mind and asked the to help him with the Creation. But as children often do, they had a mind of their own. They wanted to do their own thing. So,instead of getting stuck with the job of creation, they gave up the world and went looking for salvation. This angered Brahma and he frowned. From this spot between his brows a fifth son was born, wailing as babies do when they are born . Brahma named him Rudra, (Rud, meaning ‘a wail’). Brahma asked Rudra who was filled with fear of the world and born in the shadow of his anger, to go dwell in all things. The sky, the air, the water, the sun and moon. Brahma created ten more sons from his body. Angira, Atri, Bhrigu, Daksha, Kratu, Marichi, Narad, Pulastya, Pulaha and Vashista. Then Saraswati was born from Brahma’s mouth. Seeing the beautiful and wise Saraswati, Brahma forgot she was his daughter and began to pursue her. This upset Saraswati so much that she got up and left. Brahma came back to his senses and realised his serious folly. He was so ashamed and filled with such remorse that he dissolved himself into space. Having messed up the first attempt at creation Brahma decided to try again.Properly. He first created a brilliant body for himself and then divided it into two, the primordial man, Manu and woman, Shatrupa. They were married and had two sons Priyavarta and Uttanpad and three daughters:Aakooti, Devhooti and Prasuti. Aakuti was married to Ruchi Prajapati, Prasuti was married to Daksha and Devhooti was married to Kardam rishi. It is their children who went on and populated the Earth. This creation came to be known as ‘Maithuni Shrishtai’. Maithun is Sanskrit means, the union of male and female. Brahma also sprouted the four Vedas from his mouth and created such things as Dharma( righteousness or Truth) and Adharma( un-Truth ), anger, desire, fear, attachment, joy and suffering. He then grew so proud of all that he had created, he began to think he owned Prakruti( Nature ). Then he began to fear the many forms that Nature took. The whole process of creation seemed to be spinning out of control. 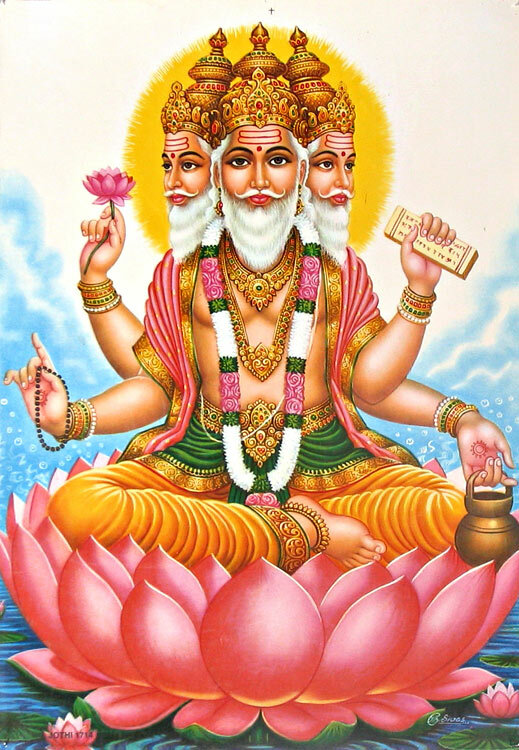 Brahma sprouted four heads looking in four directions in an attempt to control Prakruti. He forgot that Nature had created him in the first instance. She was his mother and she would not be controlled by him. So full of himself was Brahma that he sprouted a fifth head, his Ego. With Brahma growing too big for his boots, the very balance of nature was threatened and Shiva had to step in. He chopped Brahma’s fifth head off. Without his ego gone, Brahma no longer associated himself with Prakruti. He neither feared her nor wanted to control her. Prakruti( Creation) was now left to follow her own natural course and obey her own natural laws. This is the reason why not many people worship Brahma anymore. PS: A delightful version of this story is narrated by Joseph Campbell in his wonderful documentary, Power of Myths. It is from the point of view of Indra. I may post it at another time but meanwhile here it is….